It's been a tough week! My favorite guy, who is never sick, has been sick since Saturday! Seems like there's not a whole lot Will's tummy can tolerate right now, except my homemade Easy Greek Crock Pot Yogurt and homemade applesauce! 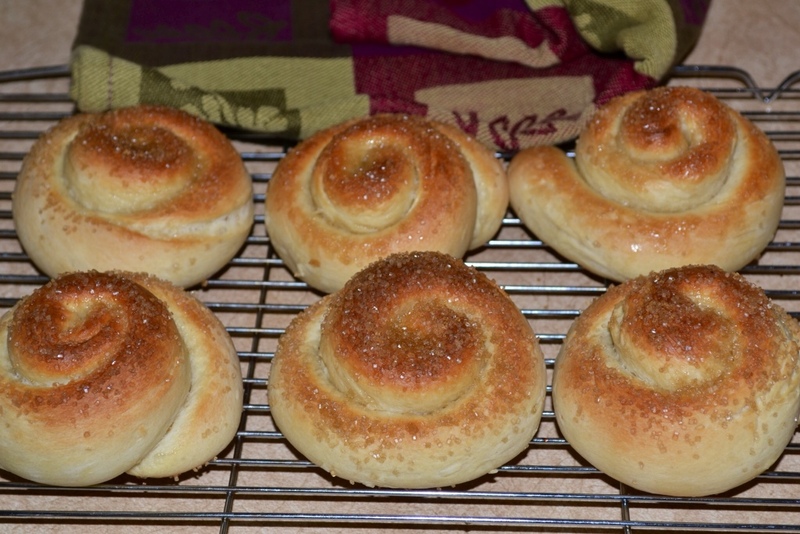 I made these wonderful Sugar Buns today and but they didn't bode well with my patient . . . So, I've tucked them away in the freezer for us to enjoy together, when Will's feeling more like his old self! Coconut Milk Sugar Buns! Yum! This is a recipe for your bread machine, but could also be done by hand or with the help of your mixer. It's important that you follow the instructions, instead of dumping the ingredients in for normal bread (I didn't read the directions and it did make the process more difficult). Pour the coconut milk, milk, egg and vanilla extract into the bread machine pan, unless the instructions for your bread machine specify that the yeast is to be added first, then reverse the order. Sprinkle flour over the liquids, then the coconut, ensuring the liquid is completely covered. Add the salt in one corner; the sugar in another and the butter in another corner, keeping each separated from the other. Make a shallow indentation in the center of the flour (not exposing the liquids) and add the yeast. Set bread machine on DOUGH CYCLE; press start. Add parchment paper to 2 baking sheets, or lightly oil your sheets. When dough cycle has finished, remove dough from the machine and place on a very lightly floured surface. Work with 1 piece of dough at a time, keeping the rest covered. Roll out the dough-balls into 15-inch ropes; rolling briskly, using both hands with fingers extended. NOTE: If sections of the rope flatten out open them up and add a touch of water from dampened fingertips; close back up and continue briskly rolling. 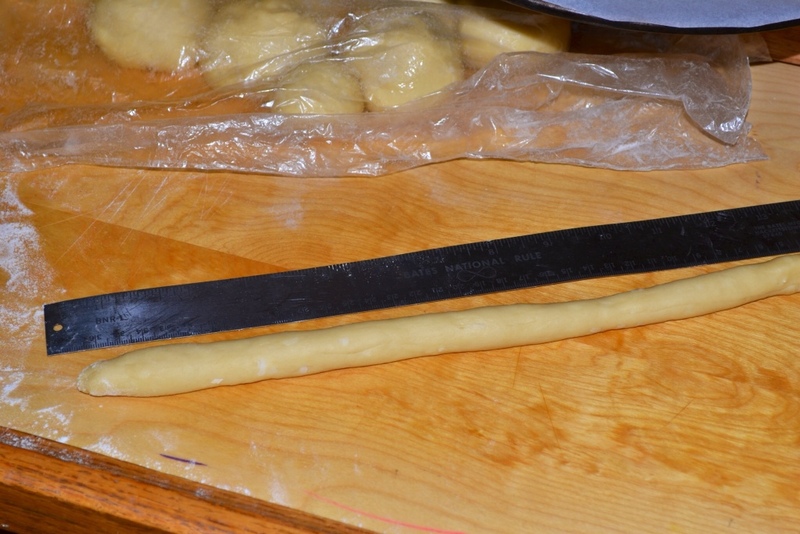 Curl the rope into a loose spiral on one of the baking sheets, tuck the end under the bun to seal. 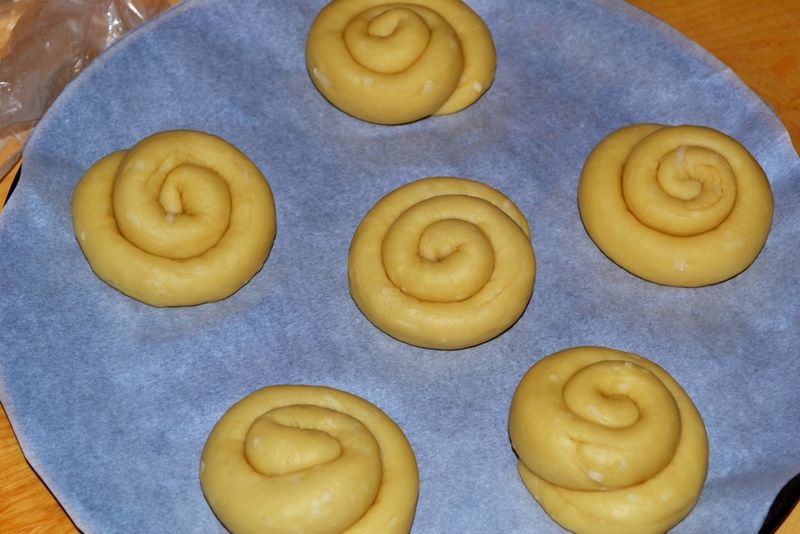 Repeat with the remaining pieces of dough, space spirals well apart. Brush buns with melted butter and sprinkle with Demerara sugar. Bake for 15-17 minutes, or until the buns are golden (see photo). Cool on wire rack, and or eat while still warm. 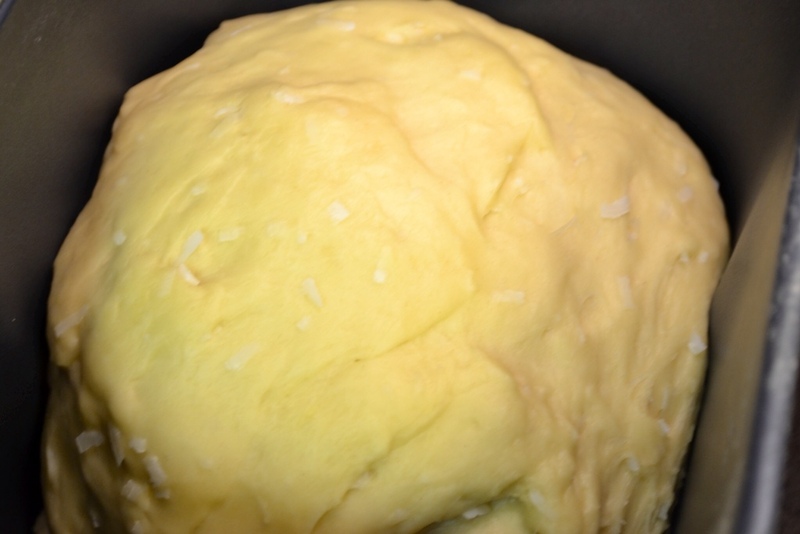 Coconut Milk Sugar Bun dough after 1 hour and 30-minute DOUGH CYCLE. 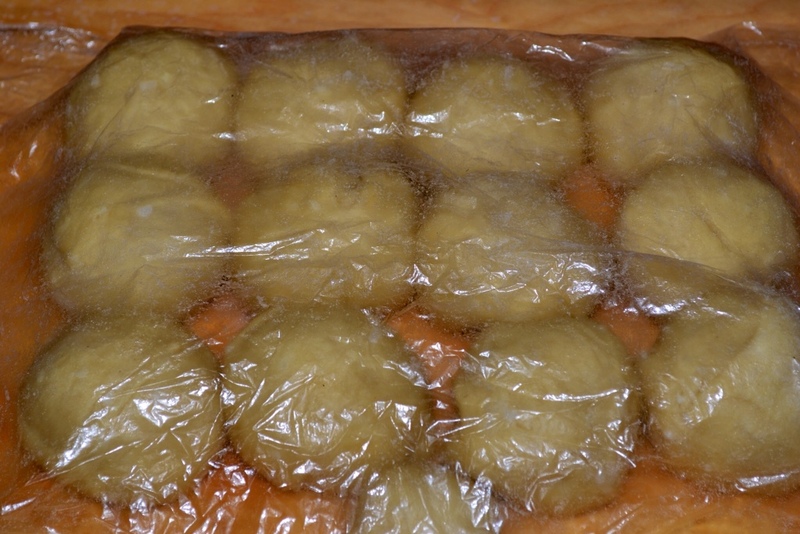 Dough weighed and divided into 3-ounce balls, covered in oiled plastic wrap. Roll dough into 15-inch ropes. Roll into loose spirals, tucking the end under the bun. I can't wait for our daughter, Annie to try these! She loves everything with coconut! These sugar buns have a wonderful buttery texture from both the coconut milk and butter, a mild coconut flavor and a delicate sugary crunch! I know when Will's feeling better these will be a big hit . . . Over at Julie's!!! Recipe source ~ adapted from BREAD MACHINE how to prepare and bake the perfect loaf by Jennie Shapter. I am hoping I will have one. I need to come over before dad gets better. Annie, you'd better hurry! Dad's starting to feel better! I'll keep 1 hidden in the freezer just for you!